Atheneum Books for Young Readers, 9781416958239, 346pp. At first Billy's father just seemed distant, as if he had something on his mind. Then he stopped listening to music, saying it hurt his ears. After a while he stopped eating and sleeping. And after that he just stopped. Stopped being Billy's father and his friend and became someone else. Someone who was depressed and withdrawn and wouldn't respond to treatments. Determined to help their father, Billy and his family devise a series of unconventional therapies for him. But the strain of looking after Dad begins to wear on them all. Billy stops writing songs and starts avoiding his friends. His sister wants to suicide-proof the house. And his mother worries about losing her job because she takes so much time off. Taking care of Dad is starting to sap the strength they need to keep him alive. 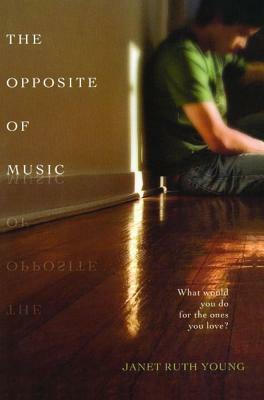 The Opposite of Music is a powerful and realistic debut novel about the lengths a family will go to in order to save one of their own, and the strength it takes to learn how to ask for help. "No reader can fail to be touched by the combination of determination, courage, and magical thinking that the Morrisons call forth when they realize their father has lost his way. Every family fights similar battles. But few families have an innovative and compassionate writer like Janet Ruth Young to chronicle the struggle."